You may have noticed that some things have changed around here! I decided that I needed a little bloggy pick me up. I spent 12+ hours this weekend revamping my blog design, and I couldn't be happier with it! I have a few more little features to add, but on the whole, I love it. If you all notice anything wonky, please let me know. I haven't tested it in all browsers yet, I still need to get my hands on a PC to see what it looks like in IE. 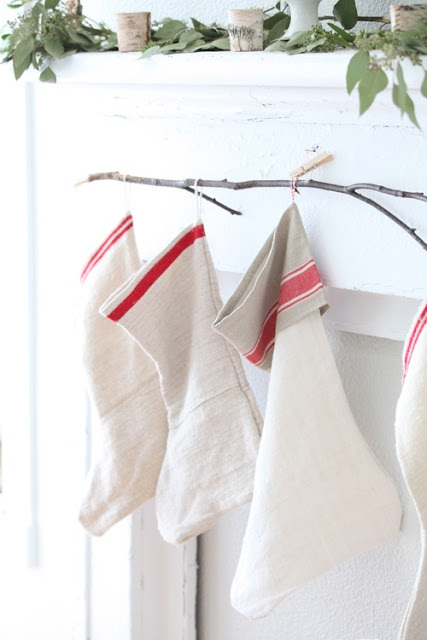 In addition to my blog revamp, I have a whole list of house projects for the new year. Some small, some big, but all things that hubby and I have been wanting to do for awhile. I am looking forward to the new year and what it will bring! That brings me to our holiday cards from this year. There is a little New Year's message at the end! Hope you all have a very Happy New Year with lots of love and happiness! Posted by Jennifer at 8:57 AM 2 I would love to hear from you! Well, this post is late...really late. But, better late than never, right? I hope you all have had a wonderful Christmas - ours was hectic but we had some great family time! Just wanted to write a quick holiday recap post to share some of my Christmas decor. I said I was going to post my mantle weeks ago, so here she is in all of her glory (even though some of it is about to come down). I will share my winter update soon though! I also love to update my built in shelves for each season. The mantle and shelves come hand-in-hand! And just a little ditty I hung in my foyer - this will stay up for the winter season! Thanks for joining me on this way overdue post! Posted by Jennifer at 1:03 PM 0 I would love to hear from you! Friday I'm In Love - A Guest Post! Hi Everyone! I have been a bit under the weather this week with the flu. It's going around my house, not fun. The good thing is that this is the perfect time to welcome my first Friday I'm In Love guest blogger, Anna Thompson! 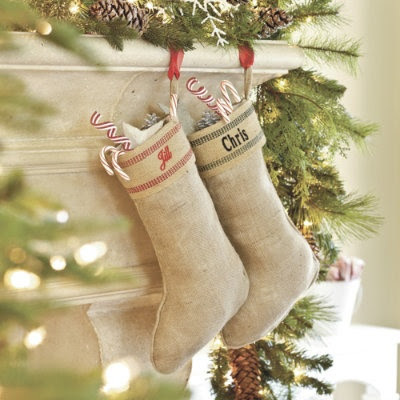 She writes for Arcadian Home and has some wonderful "Favorite Things" to share with you just in time for the holidays!! There is so much beautiful inspiration here, enjoy! Hello, all! It's Mari visiting from Arcadian Home blog, a wonderful place to find beautiful home decor inspirations. I'm so happy to be here at Social Salutations. Today, for a guest post in Jennifer's very popular series "Friday I'm in Love", I have chosen two of my loves, Scandinavian style and decorative pillows. I hope you enjoy the rooms I've chosen to share with you as much as I enjoyed pulling them together. They speak volumes about the diversity of this lovely style and how toss pillows have global appeal. Here's wishing you inspiration! This enchanting living room seen at A Storied Style is filled with the beauty of the enchanting Swedish Gustavian style. The made-over antique settee is topped with a lovely array of pure white pillows. From aged beauty, we turn to a stylish modern white room with stylish gray, black and white furnishings. I love the menswear feel of the sofa and toss pillows and so does Mr. Bazaar at Bright Bazaar. From brilliant sapphire to deep dark navy, this gray space is awash in lovely blues. How clever is that unexpected little contrasting bit of green on the low-hanging pendant light? This lovely image comes from Natalya at A Life More Ordinary. I am totally in love with this vintage room with tall white stove from Vita Ranunkler. The charming collection of pillows is a perfect of rustic grain sack, cozy knits and a single touch of pale velvet. From the furry rug on the floor to the gorgeous art on the wall, this is such a pretty room from I Don't Know How She Does It. The use of pillows here is spare but perfect. How many ways can we do decorative pillows in white Scandinavian living rooms? Each pillow collection seems to have its very own unique look. This appealing mix of textiles, whites, darks and patterns is from Nordic Bliss. I love the simplicity of the table decorations so charming. With an eclectic look so suited to today's living, this chic bedroom showcases the homeowner's personality. I have been smitten by the colorful pair of pillows with whimsical green birds. You can see more images at Canadian House & Home. Lastly, this beautiful rustic outdoor vignette is from a post on Emmas Design Blog all the way back in 2009. Scandinavian style, toss pillows and a stunning landscape, what a wonderful look. Images 1 | 2 | 3 | 4 | 5 | 6 | 7 | 8 What do you think of these spaces? Leave us comments below, and stop by Arcadian Home for more home decor, lighting fixtures, and interior inspiration. Hope you enjoyed Anna's beautiful inspiration! Have a wonderful weekend! Posted by Jennifer at 8:28 AM 0 I would love to hear from you! With our new addition to the family this year, we are one stocking short. I decided to tackle the project head on and pull out the trusty sewing machine - we're not the best of friends. We've had our ups and downs, but this time I think I showed that machine who's boss. (Riiight). 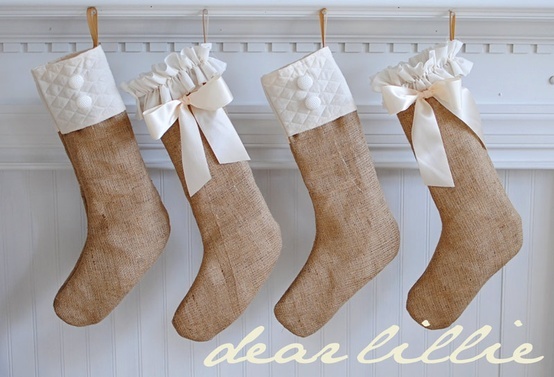 These from Dear Lillie are so sweet! I had toyed with the idea of using a burlap coffee sack that I picked up, but in the end there wasn't enough fabric for four stockings. After I scoured my fabric supply I decided on using some left over drop cloth fabric that I had laying around. It looked most like the stockings I found online that I liked so I just went with it. The same day I picked up the coffee sack, I also bought an old grain sack as well. I loved the red and blue stripes it had, and it also has some writing on it as well. The only bad thing about it was that there are some pretty large stains - big enough that I wouldn't be able to use it for pillows or upholstery. I decided to use the striped part of them to make the tops of the stockings. I'm actually still in the middle of this project - two down and two to go! Hopefully I can finish before Christmas!! Posted by Jennifer at 12:04 PM 1 I would love to hear from you! Friday I'm In Love is back this week with some gorgeous gift wrap ideas! As I have been scouring the bloggy world this week, I came across some beautiful packages for the holidays. I love giving a gift that not only looks good on the inside, but on the outside as well. These ladies have some great ideas, and they are easy to pull off too! Every time I toss a toilet paper roll I stare at it wondering what it could be, and 9 times out of 10 I come up short. Jill from Create. Craft. Love., on the other hand, found a great way to re-purpose them as these adorable pillow boxes! I love the pop of color on the craft paper, so cute! Meeha Meeha has outdone herself again with this snowflake and pom pom gift wrap! If you love those poms as much as me, head over to her blog for the tutorial. So adorable, right? Finally, if you're like me, you wonder how to make edible gifts look good for the holidays too. How cute is this cookie packaging from Jo-Anna at A Pretty Life In The Suburbs? Her tutorial is great, make sure you head over to check it out! That's it for this week. I hope you enjoyed these amazing ideas as much as I did! Posted by Jennifer at 8:57 AM 5 I would love to hear from you! This year we have had a little elf visiting us through the holiday season. Addison has named her Calup, and she has been getting into all sorts of trouble. We're having so much fun with her that I wanted to include you all in her latest adventures! Day 2: Who knew elves likes dominoes? Day 5: Someone's in Trouble! Day 7: A Date with Prince Eric... drinkin' out of a redneck wine glass! So Naughty! That concludes week 1. Stay tuned next week for more elf shenanigans!! Posted by Jennifer at 3:46 PM 0 I would love to hear from you! I can officially cross something off my bucket list. A few months ago I entered into "Organizing Solutions: Room by Room" Talent Scouting Party at WhisperWood Cottage. The winners that were selected would have a feature in the January issue of Cottages & Bungalows Magazine. I have always dreamed of it (but never thought I would have a shot), so I entered my craft room/home office on a wing and a prayer. I never in a million years thought that I would be among the beautiful projects selected. The day Amy announced the winners I rushed over to her blog to see if by chance I was among them. I scrolled down the list oohing and ahhing over the selections, with each one I will admit I got a little sad. Until, that is, I got to the very last one - holy crapola it was ME!!! Well, the Magazine is out!! Words cannot express my excitement as I rounded the corner into the magazine section at Publix and saw the issue sitting right on top. I sat down on the floor until I found it - wow. There it was - I was officially published!! Thanks to Amy at WhisperWood Cottage for hosting such a unique opportunity for the little bloggers out there like me - what an amazing opportunity. Congrats to the other wonderful ladies who were also selected!! Posted by Jennifer at 7:49 AM 1 I would love to hear from you!